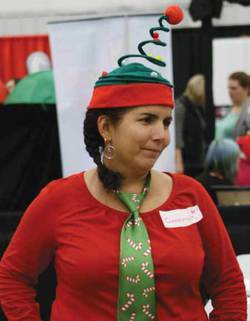 Nov. 24, 2013 8:00 a.m.
Just one of the "elves" ready to assist patrons in Santa's Workshop which was manned by the Leduc Boys & Girls Club. Photo by Lorna Lowe. The 2013 Canadian Tire Festival Of Trees, put on by the Leduc Regional Chamber of Commerce was a fantastic kick off event for the Christmas season. With approximately 7500 people flooding through the doors and into the transformed LRC field houses over the weekend, the Festival of Trees is quickly earning its place in the list of "must attend" events that take place in Leduc throughout the year. Numerous vendors took part in the Marketplace offering sweet treats and unique Christmas gift ideas. With everything from hand made flavoured marshmallows, to beautiful jewelry, to funny signs, to lovely Christmas decor created entirely from repurposed items, there were options for every taste and style to be found. Of course if you wanted something that was truly one-of-a-kind there was always Santa's Workshop where kids of all ages could sit and make their own ornament or festive creation with help from volunteers from the Leduc Boys and Girls Club dressed up as elves (or maybe it was elves dressed up like volunteers from the Boys and Girls Club!). The Leduc Splash Moms and Mommy Connections joined forces to add a little extra sweetness to the event by manning a snack stand featuring cotton candy and snow cones. And for the grow ups, on Friday night there was the ever popular Spirits Of Christmas event where attendees could sample dozens and dozens of different types of liqueurs, beers and wines. On Saturday, kids packed into the banquet area as the original, ‘How The Grinch Stole Christmas’ movie was shown for free on the huge projection screen. Sunday afternoon featured the always sold out, ‘O' Christmas Tea’ sponsored by Kosmos Kitchen, with live entertainment by Bella Vita Music and Alberta Heartland Chorus. Another popular stop for the wee ones was the North Pole Post Office run by Leduc-Nisku Rotary volunteers. For those who think the art of letter writing is dead they should have seen all the bowed heads and little hands grasping pencils that were rapidly filling up sheafs of paper with tinsel wishes and sugar plum dreams. Of course, one of the main draws for the event were the groves of spectacularly decorated Christmas trees spread throughout the entire area. These pinnacles of decorated greenery were as varied and unique as the people and organizations that created them. Thirty four trees were entered, a few just as displays but the vast majority were available to be bid on with the proceeds going to charity. There were themed trees like the Tim Hortons tree covered in Timmy's paraphernalia, a tree hung with animal treats and toys donated by the Leduc Animal Hospital with proceeds going to the County of Leduc Animal Shelter Society, and a Country Kitsch tree entered by the Roth family that was created by using antique wooden boards, rusty barbed wire and cut tin stars. At the conclusion of the event the donated trees ended up bringing in $6945.00 for eighteen local charities. A tremendous amount of work went in to making this years' Festival Of Trees the hit that it so obviously was. Innumerable hours were put in by volunteers from many different community organizations and each and every person involved in making this event such a huge success should definitely take a bough!